Lately I have been thinking about the various backdrops I've enjoyed through different chapters of my life. A friend of mine recently wrote about how someone wise once told her that not having one true childhood home will stunt a child's ability to connect with their environment. This particular friend's lifestyle requires rather big moves every few years, so she protested that her child would grow to love many environments, on a general level, and would be come a "global steward," of sorts, to which the Wise Person replied, "Ah, but the power of nature lies in its particularities." This Wise Person had my friend promise that she would strive to at least teach her child(ren) about local birds, "as a start," which she's done, and which I heartily approve of. However, I think living in multiple places is like having multiple children. You always worry about how you can love a second (third, fourth, fifth...) child as much as the first (second, third, fourth...) but soon learn that, as cliché as it sounds, love for your children can only be multiplied, not divided. So too with the concept of home. It is possible to love multiple places fiercely. I also believe that a change in scenery provides a necessary component of embracing particularities. A new environment arouses a childlike curiosity in an otherwise dull and jaded adult. When we lived in North Carolina, for example, I was constantly pointing out cardinals to my children. Cardinals and eastern bluebirds and turkey vultures. These birds were so different to me (even if technically their range stretches as far west as Utah, I haven't ever seen a cardinal or turkey vulture here—at least not like we could spot them in North Carolina (eastern bluebirds keep strictly to the east, as their name would imply)), so I was always very excited to see them even though they were rather commonplace in North Carolina. One day I was out walking with the children and the girls spotted a robin. "Ooh! What kind of bird is that?" they wanted to know. "That's a robin," I said, not the least bit excited. Obviously it was a robin, the most run-of-the-mill bird on the face of the planet. At least, that's how I viewed the robin. My girls, on the other hand, were thrilled to have spotted such a rare creature. "Look how it's tugging at that worm!" one of them said. "How funny to eat a worm!" "It's only red on its tummy," another one observed. "It's so pretty!" It was much rarer to spot a robin than to spot a cardinal at our house on Hummingbird Lane ((at least in our bird-watching experience) and don't get me started on the hummingbirds...and the butterflies...*sob*...which are also just not so plentiful here). I had grown up watching robins hunt through the grass for worms (on our front lawn in PoCo) and one year a robin built a nest under our back deck and I would check on it daily, peering through the boards at the lovely blue eggs, watching them hatch, watching the babies grow (at our house in High River (we could hardly play in the backyard that spring/summer without getting swooped at and chided by Mr. and Mrs. Robin (though they didn't seem to mind us playing right on top of their nest; I guess they figured their solid wood roof would keep them safe)). Robins seemed so normal to me. My girls, on the other hand, could hardly understand why I'd get excited over a measly cardinal. Their excitement over something I considered mundane helped me to see with new eyes. I guess, in a way, seasons allow us to keep re-seeing our surroundings. I love hot summer days, the changing of the leaves, a fresh snowfall, but nothing compares to the beauty of winter giving way to spring (perhaps because I loathe winter a little bit). 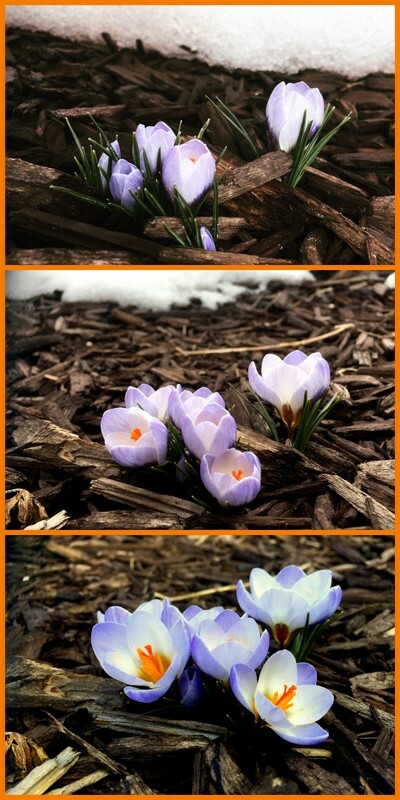 So I've been keeping track of the crocuses in a neighbour's yard as I've been walking to pick up my little kindergartener from school every day. As I was snapping that last picture, I got a bad-news text from Andrew. News so bad I almost shouted "WHY!?!??!" into the sky. The news was that we still have no answer for what we'll be doing after he finishes his contract here (at the end of the semester so...next month...deep breaths...it's fine). It was a little crushing for me (even more so for him, I imagine, since he's the one sticking his neck out), but I wasn't as upset about it as I thought I would be. Instead I filed that particular prospect away in my "dead dreams" folder (this folder is huge) and tried to feel thankful that I got the news while I was out walking so I could pound out my frustrations on the pavement and try to work through my emotions while the kids weren't pestering me (being tucked into their front carrier, stroller, or classroom). I didn't shout "WHY?!?!?!" into the sky, but I did mutter it several times before offering more sacred prayers in my heart. This news kept me thinking about the many backdrops of my life. It's true that I may not have had the same woods to explore every summer of my childhood, though I'm sure that's a fine way to grow up. Instead I got to explore many different woods and, honestly, that was a fine way to grow up, too. My life is like that of Laura Ingalls Wilder (only far less homestead-y). It's a collection of books, each set in a different place. In the Shadow of Burnaby Mountain I played with friends in the forest on the hill. We thought we couldn't be seen, though our mothers were watching us from the windows. Often we played Teenage Mutant Ninja Turtles. I was always April and one day the little boy who was pretending to be Splinter said that I had to kiss him, so I kissed him on his cheek. I have no idea what his actual name was. I learned to ride a tricycle and my friend Bria taught me how to roll my R's. The tire swing was the most popular attraction of our apartment's playground. One of the apartments in our area burned down and scarred me for life. The Kings lived there. I had a friend who had a prosthetic limb in preschool and the way she picked up raisins mesmerized me; our class often went on nature walks. My mom had to do laundry at a laundromat, maybe. I would walk with her to pick up my brother from school—past the burned-out apartment building, which terrified me. On the Banks of Hyde Creek I fell in love with ferns, huckleberries, pine trees, moss and rain. I'm haunted by the memory of the creek running dry, leaving the salmon fry to rot in the sunshine. I worried about bears and cougars and orb weavers. I spent many happy days squelching around in our muddy backyard and frolicking in the woods on the way to school. My friend Vanessa and I tried to string a tin can telephone between our bedrooms. I loved to collect bugs and once named a caterpillar after my principal, Mr. Kro...ker? My brother's friend Robin (a boy) would eat worms just to make girls scream. My friends and I once buried a butterfly in a cookie tin in the back yard. I learned about snow On Deer Path Road. I also learned to recognize deer tracks and deer poop and saw a lot of deer. I wondered if the world would ever thaw out. I wondered if the deer wondered that, too. I rode a bus to school. My schoolyard was a plain, flat field—so different from my old school, with forests and a creek right on the school grounds. Everything was flat on the prairie, but the big sky made up for that. I would sometimes sit in the solitary tree in our front yard, wishing for more trees because I missed trees. By the Shores of Sunshine Lake I enjoyed riding my bike on the Happy Trails and collecting critters from the lakes with nets made from old hangers and pantyhose. I learned about the Medicine Tree and waited every year for the Highwood River to breech its banks (it never did...until 2013, but I didn't live there then). My school—Spitzee—seemed very old (it was built in 1912) and my classroom was on the very top floor. In the spring our lilac bushes would bloom and the smell was divine. I learned about rodeos and skating on wild ice. My mom's cousin Don called me Nannyberry and taught me all about insects and let me tend the goldfish in his backyard. Fireworks over the lake were magical. While visiting The Farm at Grassylake, I learned to love canola fields and to watch out for cacti and rattlesnakes. After a hard morning of rock-picking in the fields, my cousins and I would enjoy floating down the canal in inner tubes. We'd sleep out on the trampoline, listening to coyotes howl in the night. I kept my older cousins company in the combine during wheat harvest. I drove tractors and four-wheelers and helped brand cattle. My cousins called me a city slicker (coming, as I did, from a town with a single stoplight). During this time there were also many visits to The Hancock Dairy, my birthplace, the land of my forefathers. We'd go every year to watch the parade on Canada Day, which my grandma always tried to make the happiest of days (even though it was the anniversary of her mother's death (her mother died when she was sixteen)). My cousins and I would gorge ourselves on her lemon pudding and played hours of games: Crokinole, Pit, ping-pong, sardines, croquet. Often we'd sing around the piano, or sit in a chain and brush each other's hair. My cousin Elizabeth once came up from Utah and was deathly afraid of mosquitoes. We Albertan cousins found this was hilarious.Mosquitoes are ubiquitous in Alberta. We should have been kinder. At The Foot of Timpanogos, I learned about the importance of snow in the mountains (if there is no snow in the mountains there will be no water in the valley). I learned a little bit about tending fruit trees: apricot, pear, and apple. I once hunted through sagebrush, searching for a missing person. Morning runs up and down the canyon were a far more enjoyable way to take in the scenery. Bridal Veil Falls and Nunn's Park and Vivian Park and Aspen Grove and Deer Creek Reservoir...many, many adventures enjoying the mountains. Living on Morozova Street taught me independence. I would walk home from the bust stop each evening, jumping at shadows moving between the trees, clutching my cell phone, pleading with the feral dogs to keep their distance. Mostly it felt like a cold, snow-covered concrete jungle, but when the snow finally melted it revealed a beautiful city. I had many good chats with friends, while walking the banks of the Voronezh River. My bedroom was sparsely furnished; the walls were light purple. The kitchen was decorated with sunflowers. A drunk man once relieved himself on my boots (while I was wearing them). My favourite church activity was a picnic in the woods. I regret that I never got to visit my host family's dacha. At The Cabin in Grover, I felt like I had landed in Mars. As far as I could see the earth was red. It was surreal. I saw my first scorpion. I jumped from the cliff at Calf Creek. I hiked through the aftermath of a flash flood in Sulphur Creek. I saw the forts my husband built as a child and continued to build on the fort with my children. At al-Husn my world was farmland and goats and rocks. I got so terribly sick and my husband was so busy commuting to Amman that he hardly knew. We didn't know where to shop or how to call a taxi. I finally screwed up enough courage to venture out on my own and some children found me and took me to meet their friends, who gave me some chips to eat and showed me around "town." I was both sad and happy when we found an apartment in Amman. Bridget brought us soup our first night. Soon my friend Crystal arrived with her family. Those women became two of my dearest friends. We hiked Wadi Mujib, we explored Petra, our everyday adventures took place to the song of traffic, the call to prayer, and wedding fireworks. Falafel and shwerma were my life. Our First Home was at Stonewood and nature was fairly sparse. It mostly involved playing on the lawn with my baby, blowing dandelion puffs, collecting pinecones and avoiding steeping on thistles with bare feet. Our Maadi Days were filled with magic. I never imagined a city in a desert could be so lush and green. Mangoes would mysteriously appear on our deck, which we found odd until we realized the tree just outside our patio door was a mango tree. Poinsettias bloomed in the winter, but their sparse "flowers" were put to shame by the glorious flame trees, painting our street's canopy a dazzling bright red. There were so many potted plants kept alive by green-thumbed boabs. I found hoopoes and egrets tantalizing. Walking along the Nile was my favourite activity (though a felucca ride at sunset was even better). No matter the season, something new was blooming. My baby was born on an island on the Nile. I will always be thirsty for the Nile. At Eno Way, I learned the names of every weed making up the ground cover of our backyard as quickly as my baby could stuff them in his mouth. The subtle smell of onion wafting through the air would tell us that someone somewhere had recently mowed their lawn. I was forever battling poison ivy and worried constantly about spiders and snakes (specifically of the venomous variety). Crape myrtle trees and azalea bushes brightened up nearly every yard. Squirrels and moles wreaked havoc in our garden and lawn. Cicadas made for some noisy summer nights; their synchronized death when the seasons changed always made fall seemed too quiet. The Eno River ran through our neighbourhood and our life. Hardly a day passed that we didn't think about the river. We'd watch for turtles and snakes as we waded through the warm waters, we'd hike along its banks, and explore its woods. Sometimes we'd just head to the river to chuck rocks in when my baby grew up and turned into an energetic toddler. Him, careering down the path, me following with the new baby (always, always, I was scanning the path for poison ivy). And now here we are, once again At the Foot of a Beautiful Mountain. It's our first year here, which is the year of learning and settling in, the year of culture shock. We don't really know what spring will bring, except I imagine it will involve a whole lot of peach blossoms. We are still eating the peaches we canned while waiting for our newest arrival to join the family. Every day my babies and I walk toward the mountain, toward the school. We marvel when we see it hidden by clouds while we're walking in sunshine. We admired it as it turned from green in the summer, to red and yellow in the fall, to white and grey in the winter. As crocuses bloom here in the valley, we look forward to seeing the mountain put on her green dress once again. What will the next installation of this series be? I haven't the foggiest idea (but, like I mentioned, my "dead dreams" folder is huge). Wherever it is—whether a new place entirely or an encore of a place we've loved before—it's sure to bring with it a beautiful backdrop filled with flora, fauna, family, and friendship. I suppose those who've lived all their life in one place are lucky for the depth of their roots, but I think my life has been just as rich (though in a different way). The mountains there sound beautiful! I still like robins and really don't see them all that much now that I think about it. Hmmm. Maybe I need a bird feeder. My sister sees a lot of birds at hers. Sorry about your disappointing news. What a wonderful writer you are, Nannyberry! Ahh the dead dream folder. The worst was match day when we were almost certain where we were going and then we openned the envelop up and we weren't going there and we weren't going to the other places we wereg going and it was in front of everyone and we had to smile and nod and announce it. We ended up going to the place I now miss the most...so I guess it all worked out but that moment when I first felt that disapointment still hurts when I dwell on it. Hope you get some good news soon. Oh Nancy I feel like you have put into words my exact feelings that I've felt so many times over the years through so many moves! I am sorry for your bad news and I hope you can find your way forward, wherever/whatever that is. It's clear from this post that you have learned to thrive in so many different places. I have no doubt that you will thrive wherever you end up next, in whatever situation. That's cute. That's not cute.